Would you like to get a FREE charm? Do you have a blog? Send us an email with a link to your blog showing us where you have blogged about us- and we will send you a FREE sterling silver charm personalized with whatever you would like on it! 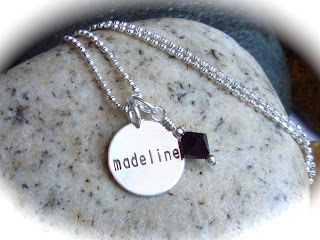 Compliments of www.ideclarecharms.com! We love to hear your “charming stories”. Share with us a special charm story- a special someone you gave a charm to, a race you ran, a special motivational phrase you have on your charm, anything!– and you could win a FREE sterling silver necklace. Each month we will be featuring a retailer that we love~ and that is carrying i declare! charms. This month we want to tell you about Little Cherry Blossoms. Nestled among award-winning Ume clothing boutique and the ever-popular Needle Point Joint on Ogden’s more-charming-than-ever Historic 25th Street, Little Cherry Blossoms is giving moms (and many baby shower attendees) something to shout about. A haven for baby shopping, this boutique is known for scouting out the lastest and greatest in the kiddo community. Let your registry get more sophisticated than the Babies ‘R Us route, and give this shop a try. Your shower guests will get all the hand-holding they need, plus they have the really cute ‘n necessary stuff you really want like lightweight Aiden & Anais blankets, Trumpette socks and the softest pima cotton convertible gowns from Kissy Kissy. What’s that you say? You don’t live in Weber or even Davis County and you’re not much for driving? Then hop over to Little Cherry Blossoms online, where you’ll find the same cute stuff, and be taken care of just as nicely. or check them out at www.littlecherryblossoms.com- and be sure to tell them we said hello!